We all love chocolate and can’t deny it. But there is one chocolate that has made all of us drool – Cadbury Choclairs! So when the makers, Mondelez Foods launched an even bigger, more chocolatey version called the Cadbury Choclairs Gold, the brand knew the launch had to be big. Touted as the ‘Chocolate ka atom bomb’, the chocolate major wanted Cadbury Choclairs Gold to literally have an explosive campaign on digital. The focus needed to be on the bigness of the new chocolate and how one needed to open their mouth wider to have it. The ad film features this impatient guy at the end of a movie ticket line making mistaken remarks at a family spending more time than usual at the counter. His mouth opens wider with each new reveal to finally open as much as required for him say ‘Aaa’ and pop in the new Cadbury Choclairs Gold. The chocolate bursts inside of him, as he begins to drool in the chocolate. Communication was extended creatively on the digital front. 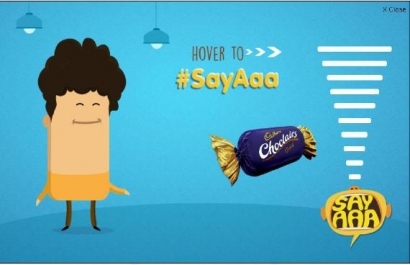 The idea was to establish that the best way to have a Cadbury Choclairs Gold is by ‘Saying Aaa’, leading to the birth of an integrated campaign titled #SayAaa. Executed in phases, #SayAaa involved educating people about what it is and the different ways of Saying Aaa. Engagement was built by getting people to Say Aaa in innovative ways. The brand started with its social media properties. Adorable visuals were shared on both Facebook and Twitter. Later it showcased different creative ways of Saying Aaa, with the help of visual updates. Meanwhile, the brand made use of creative Carousel ads on Facebook. 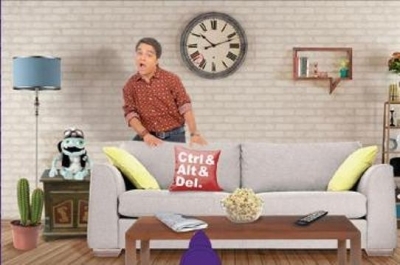 The ads encouraged people to scroll more to know more about the campaign and stress on Say Aaa. The carousel ad was divided accordingly, one during the start to explain what Say Aaa is, post that different ways of Saying Aaa and then establishing Say Aaa. All in all, three Carousel ads were created on Facebook. With Dubsmash being the new trend, the brand ran a Dubsmash contest in phase 2 of the campaign. Cadbury Choclairs Gold created their own brand channel on Dubsmash and had a couple of sounds already installed in them. Users were asked to send Dubsmash videos in different ways of saying Aaa by either using the existing sounds or a soundtrack that helped them execute the same. The winner could walk away with an iPhone 6! ‘Say Aaa’ also created an interactive web banner on MSN. Once a user clicked on the web banner on the left hand corner of her screen, she was introduced to a bigger screen where by just hovering her mouse on a volume button the character on the screen screamed Aaa each time she scrolled through it. The volume of Aaa also grew louder as the user scrolled higher and higher. As the volume grew louder, the chocolate entered the character’s mouth. His face explodes with a chocolatey blast and the same chocolatey blast completely takes over the user’s screen. The GDN banner was gamified. It had a dual screen connect where the user can either play with his phone or via his keyboard. The task was to make the protagonist eat the Cadbury Choclairs Gold while he kept dodging it. The concept was simple addictive and in synch with the quirky campaign tonality. #SayAaa has truly explored interesting ways of connecting with its TG, while extending the primary idea on digital. Playing around purely with creative content and bringing about exciting ways of fan engagement on social media has made for a memorable buzz for the Cadbury Choclairs Gold. Besides, creating customized illustrations in real-time has added that special brand affinity which will go beyond just a one-time campaign. The concept of Dubsmash user videos is not new but currently it’s the best way for a brand to leverage user-generated content. Additionally, the Facebook Carousel ads and the interactive web banner on MSN and GDN reflect the brand’s strong intent to engage its consumers around ‘Saying Aaaa’. #SayAaa is powered by a clever content marketing strategy that has helped establish the new chocolate as bigger and more choclatey. #SayAaa was much appreciated and trended in India on number 1 position. The hashtag also trended in 11 cities including Mumbai, Delhi, Pune, Bangalore, Kolkata. The campaign received 4859 tweets and 150 Dubsmash videos, while the brand created 60 real-time illustrations for users. Throughout the duration of the campaign, it generated a total post interaction of 4,73,668 on Facebook with over 4,70,278 Likes, 2166 Comments and 1124 Shares. The 3 Carousel ads on Facebook have received more than 8K, 12K and 24K Likes, with a decent number of comments and shares each.